To build on my thoughts regarding minimalism and maximalism when building a wardrobe, I’m moving beyond using accessories to add interest to a minimalist wardrobe, and onto…umm…harder drugs. I’m enjoying the freedom of going handbag-less, which unfortunately creates a lost opportunity to add a statement piece to an outfit. Some looks just need more oomph, which without adding a handbag, is hard to create. Enter the studded jacket, which just tosses on and instantly adds wow factor to even the simplest of jeans and a tee. 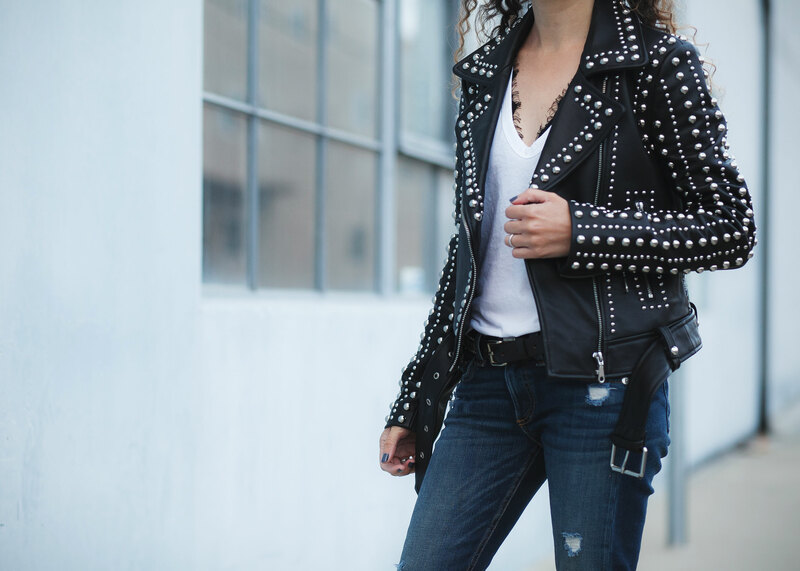 A studded moto jacket is a piece I’ve wanted to add to my wardrobe for a while, and the combination of real leather, stylishly done studded pattern, classic moto design, and a petite-friendly fit made this one a winner. This is also the second piece from Rebecca Minkoff to fit me really well in the shoulder and sleeve. Aside from my primary usage to up the ante on super simple outfits, this piece will also look amazing over wispy dresses (especially those on-trend boho florals) or feminine lace. BlankNYC – muted version by a brand known for its petite-friendly fit & great price. Nour Hammour – chic designer option (love the versatile black studs & cropped style). ASOS – non-leather version in a comfy cotton. Edgy and feminine! Love the way this embroidered leather jacket looks cool teamed with heeled pumps.